Catherine Zeta-Jones (born 25 September 1969 in Swansea, Wales, UK), is a Welsh actress. She starred in the movies, The Mask of Zorro, Ocean's Twelve, Entrapment, and Chicago. 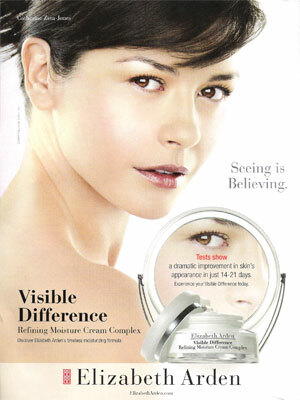 Catherine Zeta-Jones is a spokesmodel for T-Mobile, Alfa Romeo, Di Modolo, and Elizabeth Arden. Catherine Zeta-Jones interviewed by Patricia Tortolani for InStyle magazine's April 2010 issue. "You're the spokesmodel for Elizabeth Arden. What was your first encounter with the brand, which turns 100 this year? : I had eczema as a kid, and my mother would use the Eight Hour Cream on my flaky skin. I still slather it on my lips, elbows, toes - pretty much everywhere.